Now that the 2 week cold snap has passed, we are enjoying some 20 and 30 degree weather! 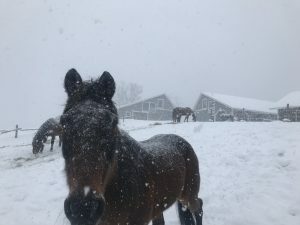 We feel like it is a mini-spring here and are enjoying wearing a few less layers. 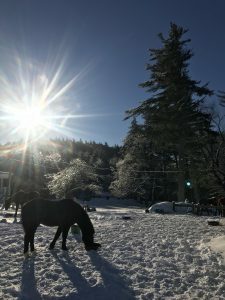 The horses are napping in the sunshine today and are able to finally relax and keep warm. We are now feeding them regular amounts and they are quite happy, in fact, we often find them playing and running around in the morning times. 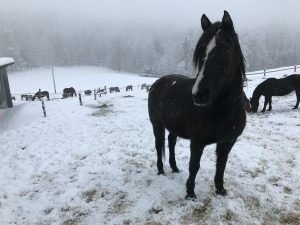 We will try to capture some of their playing and post some pictures and videos of the horses rearing up and running around in the snow! Holiday Camp this year ran from December 27th to January 1st. We said goodbye to 2017 and welcomed in 2018 with 15 dancing campers and 7 staff members! Despite the frigid temperatures, we managed to go sledding, snowshoeing, and cross country skiing. When it got too cold, we all huddled together in the cape around a game of bananagrams or baked warm chocolate chip cookies and other sweet treats. 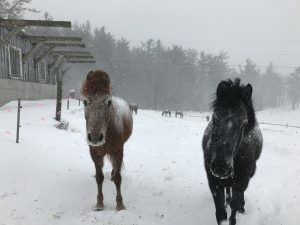 It was a full, New England horse farm winter experience!